Microfiber towels have a great many uses around the home. This is a guide about uses for microfiber towels. I've been shopping for kitchen towels in black as I have well water and everything turns yellow. The prices on these things are over my thrifty budget. So, I was walking around Wal-Mart just looking and in the automotive section I came across a pack of 8 microfiber towels for washing and polishing cars and trucks. Hmm, a nice pack of bright yellow and hunter orange towels just fit the bill. They are great scrubbers and really take up a lot of water. Problem solved! They don't (so far) show any yellowing since they were already yellow and orange to start with. Yeah! Source: My own thrifty, stingy self. 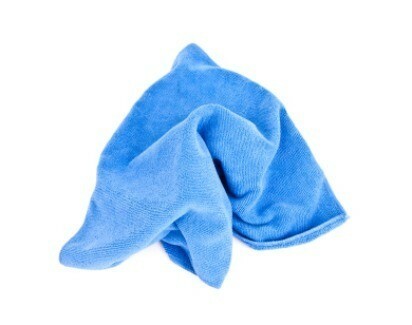 I just purchased microfiber towels and a microfiber mop from QVC.com and I love them. You use the towels to clean almost anything without chemicals. Use them slightly wet to clean countertops, your stove, the bathroom sink, etc. I have never been able to get the shower glass to look clean. This works great, I just follow the wet towel with a dry one. Same with windows. NO chemicals. The mop came with a dust mop and a wet mop. You wet mop, with no chemicals and it drys fast! I love them and no wasting paper towels to clean with, and when you are through just throw in the washing machine. After bathing my chihuahua, I wrap her up in a microfiber towel used to dry off your vehicle. These are larger and are very absorbent. I don't have to use two bath towels to dry her off. The microfiber towels works so much better.